Vintage poster created for the French release of the Rolling Stones documentary directed by the Maysles brothers during the Stones 1969 US fall tour including the infamous Altamont show featuring Santana, rosy, Stills, Nash & Young an Jefferson Airplane. Format: Moyenne 23.5x32 (60x80 cm). Poster had been folded but has since laid flat. Will be sent safely rolled inserted in a sturdy cardboard tube. Feel free to contact the gallery for any queries/questions. ILLUSTRACTION GALLERY - Art That Pops! 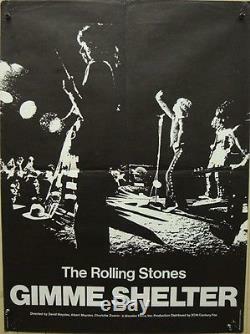 The item "GIMME SHELTER THE ROLLING STONES French moyenne 23x32 movie poster vintage" is in sale since Thursday, September 01, 2016. This item is in the category "Entertainment Memorabilia\Music Memorabilia\Rock & Pop\Artists R\Rolling Stones\Posters". The seller is "illustractiongallery" and is located in New York, New York.